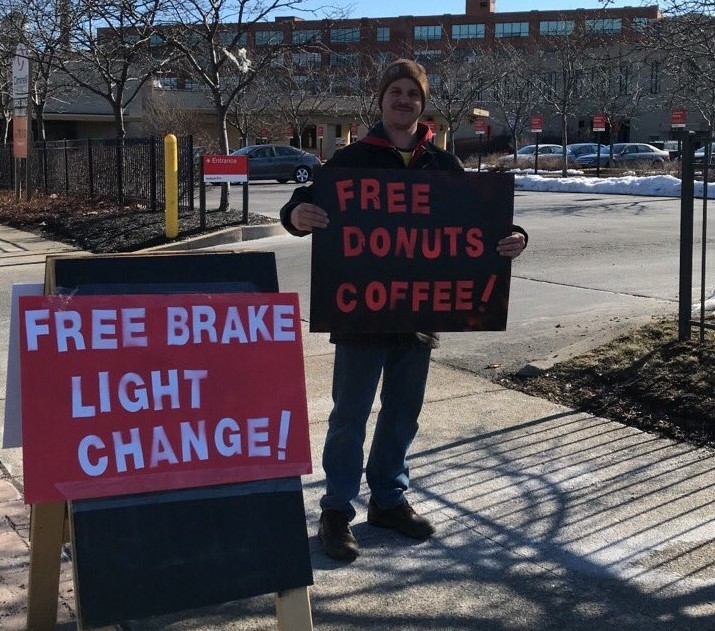 Buffalo Democratic Socialists: The Buffalo chapter of the Democratic Socialists of America held a brake light clinic over the weekend on Main Street, replacing 30 brake lights on about 20 cars at no charge. (Coffee and donuts were provided to drivers for free, too, as the photo here attests.) The action was a proactive measure intended to help motorists avoid punitive fines and unwanted interaction with police, as the city’s use of police checkpoints remains under investigation by the state attorney general’s civil rights division. Bruce Beyer, the anti-war activist who spent time in exile and jail during the Vietnam era, attended Saturday’s March for Our Lives in Niagara Square. Buffalo’s entry in the nationwide protest demanding government action to curtail gun violence was heavy on politicians at the podium compared to marches in other cities, where student activists dominated the mics. This is in large part due to Mayor Byron Brown’s office stepping in to host the event. That intervention came with advantages for organizers—permitting and equipments issues were a breeze—but one drawback was elected officials demanding their share of the spotlight. Beyer was put off by this generally, and specifically when Common Council President Darius Pridgen took to the podium: Pridgen has a concealed-carry permit and has said in the past that he carries a pistol for security. “This man’s a hypocrite,” Beyer shouted, making his way toward the front of the crowd in an effort to be heard. “He’s carrying a concealed weapon.” Good point, Bruce Beyer: Pastor, perhaps it’s time to lay down your arms. The larger point is valid, too: It is incumbent upon elected officials to listen to movements like this and then act, rather than to speak. WBFO 88.7 FM: The National Public Broadcasting affiliate in Buffalo scored a major theft in luring longtime radio reporter/anchor Dave Debo away from WBEN 930 AM. Debo, who will become WBFO’s news director next month, is an old-school broadcast journalist who will soon be freed from the confines of WBEN’s far-right programming, which features the pro-Trump views of local talk show hosts Sandy Beach, Tom Bauerle, and David Bellavia, as well as the nationally syndicated right-wing spewings of Rush Limbaugh, Sean Hannity, and Michael Savage. Don’t let management at WBEN tell you otherwise: Losing Debo is a blow to their shrinking newsroom. Debo is regularly praised by political wonks on both sides of the aisle for his work anchoring WBEN’s Hardline, a two-hour Sunday morning politics program that is a must-listen for anyone who has an interest in local, state, and national politics. Who replaces Debo as host of Hardline? We have no idea, but whoever it is will have some huge shoes to fill. Here’s hoping Debo considers eventually introducing a similar politics and policy program in WBFO’s weekly lineup. Diocese of Buffalo: After a spot appearance in the “Ups” last week, thumbs point down again on the local Catholic Church. Last week the diocese released a list of priests who had been admonished and removed from the ministry due to child sexual abuse complaints, but the list is hardly comprehensive, as Buffalo News and other reporting has shown. 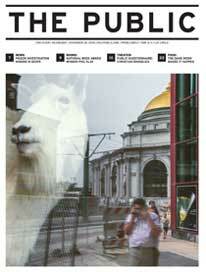 Not only that, but it contained several errors. One innocent priest with the same first and last name but different middle initial as an offending priest was named, and diocese also botched the status of several priests as being deceased or alive. On Monday, Charlie Specht at WKBW reported that a priest who was the subject of two abuse complaints was still an active priest in Dunkirk. For an institution charged with institutional abuse that is fighting to maintain the appearance of doing the right thing, these errors and omissions take on a larger import. Just who is at the wheel?